One of my New Year’s resolutions was to make at least one post on the blog every week. I knew that there’d be weeks like this week when work hit me like a truck, which is why I spent a large part of the Christmas break writing some shorter pieces chronicling my experiences with Bullfrog’s games so that I’d have something to fill the gap. Some of them I’d never played, and most of the rest I’d not played in fifteen years, and since I was stuck with a low-tech laptop for a week I just bought the lot off GoG and played through as many of them as I could, in chronological order. First up is Populous. I think it would be fair to say that Populous is not a game that has aged terribly well. 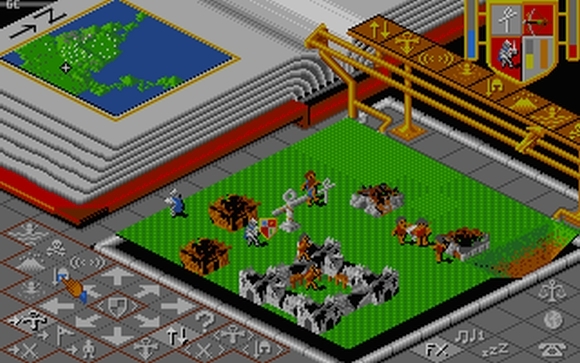 It had its 25th birthday last year; as Bullfrog’s first release all the way back in 1989 it would be pretty surprising if Populous wasn’t showing those years somehow. 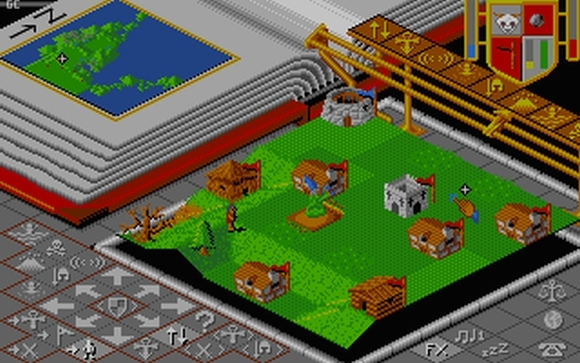 Even so, as somebody very used to archaic control systems (I once spent a summer playing through the pre-Civilization Microprose titles) I was a little taken aback at how basic Populous seems given the benefit of modern hindsight, and how painful it is to try and play now. Running at a whopping resolution of 320×200 didn’t give it too many pixels to play with, but even so Populous is downright wasteful in the way it uses its screen real estate, with two-thirds of it taken up by the UI buttons and the minimap. All the action takes place in a small box crammed into the centre of the screen which is commensurately awkward to deal with, and I use the word “action” with a certain degree of irony here because there isn’t much you can actually do in Populous.